WWDC or the Worldwide Developers Conference that occurred recently at San Francisco’s Moscone Center West showcased a flirtatious 5 by 12 foot wall display. Made from twenty 30″ Cinema Displays showcasing the icons of 20,000 of the most popular applications on the iTunes App Store. The icons pulsate and send a light wave rippling outward every time an app is downloaded from the store. 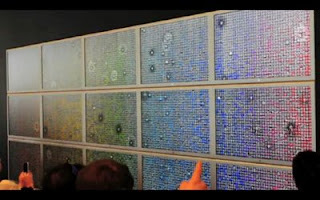 Apple has said 3,000 apps are downloaded every minute and the Hyperwall simultaneously resonates a rhizome of multiple pond ripples, visually drawing a liquidity map of iphone and ipodtouch App sales. Here are three videos each with their individualized enthrallment of pixelating pond ripples; the first is on the image of this post the second is from touch lab, whereas the third is from abearknowshow.